Sugarlane Designs: FNSI and a FNSI Finish. FNSI and a FNSI Finish. I know you’re all excited to see who was the winner of this month’s FNSI …..and I will share it with you….I promise!!! these four gorgeous fat quarters and a sweet little clipboard and notepad to record all your FNSI plans! Wouldn’t you just love them??? I know I would…Anthea certainly has great taste when it comes to picking the FQ bundles and this blue bunch almost made me turn away from my favourite reds!!!! Weeeell, Blue IS a favourite too…….as well as pinks, and greens, and then there’s …. and……and …….. !!!!!! I had a great time last night going through everyone’s posts….it took a while with 60 of you, but wow, weren’t there some gorgeous things made??? You inspired me no end…..I hope you got a chance to go and see what everyone got up to on Friday Night….I even got some ideas for Christmas swaps!!!! hee hee. If you didn’t get a chance, make yourself a cuppa, and perhaps some of that Aero Bar Slice *wink* and pop back HERE and visit everyone! 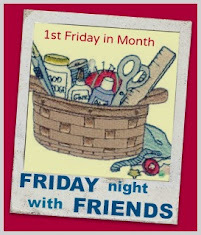 If you head back to the Mr Linky post for this month, you’ll see number 43 is………..
Kelliott aka Kelly Elliott….and it was her very first time at FNSI……is that what they call beginner’s luck??? Congratulations Kelly…..hope you have something planned for your little bundle which will be coming your way soon…perhaps we’ll see a start with it at next month’s FNSI??? I showed you my ‘almost finish’ yesterday of my challenge item for our Quilt Show……..well, today I framed it in a very manly, dark timber frame, ready for delivery so here it is….all complete and finished and I love it! I’ve called it “Lest We Forget'” and Maria pointed out to me that yesterday, when I blogged about it, it was actually Vietnam Veterans’ Day! Now how appropriate was that??? I’m off for a road trip tomorrow……travelling 7 hours south for a conference on the Arts……can’t wait, so I’ll try to pop in, but if I don’t, I will be back on the weekend….and then I think I’ll get stuck into my Bethlehem Quilt! Well done to Kelly. Wow, love your framed pic - that sets it off nicely. Well done, you. I was going to say....well exactly what Marilyn said...so "ditto"!! Gorgeous quilt, beautifully displayed in that frame. Travel safely, have a good time. Your " Lest we Forget" hanging is really beautiful and my DH would love it. Love your newest project. Didn't do friday night as I was birthday occupied. Will stitch with everyone next time. Looks fabulous in the frame Wendy. Congratulations to Kelly. Lest We Forget is wonderful - well done you! Congrats to Kelly.... and your remembrance design is wonderful! Congratulations Kelly! Beginners luck really works. Poppies are my favorite. I made a large quilt with poppy fabric. Thanks for hosting. See you next month and sooner. It is very nice post.I like it very much.Sheepbuy is the best way to sell online! Oh my...Wendy....your "Lest We Forget" is just stunning. The frame is perfect. Well done! aaggghhhhhh so excited thanks for all for your kind comments. Was a great night. I will be joining again next time...Good work everyone. It’s been a Rocky week…..